With the Buffalo Sabres in the middle of a rebuild, having a solid prospect pool is one of those essential factors moving forward. Unfortunately, the future may not be so bright for the club. Sure, it feels funny to doubt a team that includes Jack Eichel, Jake McCabe and Sam Reinhart among their young guns. But an overall lack of depth in the prospect pool is cause for some concern, especially if the goal is to make the post-season any time soon. According to Bleacher Report’s re-ranking of each team’s prospect pool after the trade deadline, the Sabres are in the middle of the pack. And at the top of the prospect list is one Justin Bailey. The 20-year-old hometown boy was drafted by the Sabres 52nd overall in the 2013 NHL Entry Draft. He’s seen eight games of NHL action, but for the most part he’s been skating for Rochester. In 51 AHL games this season, Bailey has 28 points. Some scouts consider Bailey one of those “total package” players, with a strong stride and good size and one of the best shots in his draft class. Injuries have been a problem, though. Unfortunately, things start to level off after Bailey. The Sabres traded 22-year-old Finnish prospect Joel Armia to the Winnipeg Jets in the Evander Kane trade and they didn’t get much development out of Brayden McNabb before trading him to the Los Angeles Kings in March of 2014. Russian blueliner Nikita Zadorov was traded to Colorado at the 2015 NHL Entry Draft as part of the deal that brought Ryan O’Reilly and Jamie McGinn to the Sabres. Obviously, McGinn has already moved on. The Sabres are in tough and their future looks less promising by the minute. They’ve had an unfortunate habit of trading away potential prospects and their pathway to future post-season success looks grim. There are some bright spots in terms of goaltending, though. Linus Ullmark, the 22-year-old Swede, saw action in 19 regular season games for Buffalo this season and holds a 0.915 save percentage with a 2.58 goals against average. He’s a sizable goalie and he doesn’t lack for confidence, even if he could use some work covering the angles. 24-year-old Abbotsford native Nathan Lieuwen is another possibility in the pool. 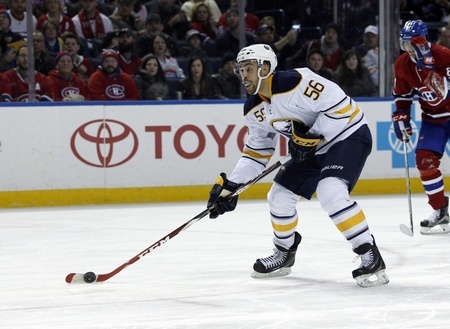 He was drafted by the Sabres in 2011 and saw limited NHL action in 2013-2014. He’s a lanky goalie and he’s good on the scramble, plus he plays well as an aggressive netminder and comes through in the clutch. While there are some bright spots in Buffalo, the future is less than stellar. The Sabres aren’t a team without hope, but a rebuilding team really should have more viable options in the prospect pool. As it is, playoff hockey is probably still several years off for the Nickel City.